Picture - Two T-33s from the 95th Fighter Interceptor Training Squadron in flight near Tyndall AFB, Florida. The farther aircraft has been repainted and renumbered in anticipation of its delivery to the Mexican air force. The Lockheed T-33 Shooting Star is an American-built jet trainer aircraft. 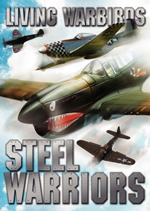 It was produced by Lockheed and made its first flight in 1948, piloted by Tony LeVier. The T-33 was developed from the Lockheed P-80/F-80 starting as TP-80C/TF-80C in development, then designated T-33A. It was used by the U.S. Navy initially as TO-2 then TV-2, and after 1962, T-33B. Despite its vintage, the venerable T-33 still remains in service worldwide. Originally designated the TF-80C, the T-33 made its first flight on 22 March 1948 with US production taking place from 1948 to 1959. The US Navy used the T-33 as a land-based trainer starting in 1949. It was designated the TV-2, but was redesignated the T-33B in 1962. The Navy operated some ex-USAF P-80Cs as the TO-1, changed to the TV-1 about a year later. A carrier-capable version of the P-80/T-33 family was subsequently developed by Lockheed, eventually leading to the late 1950s to 1970s T2V-1/T-1A SeaStar. 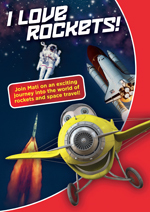 A total of 6,557 Shooting Stars were produced, 5,691 by Lockheed. The two-place T-33 proved suitable as an advanced trainer, and it has been used for such tasks as drone director and target towing. The U.S. Air Force began phasing the T-33 out of front line pilot training duties in the Air Training Command in the early 1960s as the T-37 Tweet and T-38 Talon aircraft began replacing it under the Undergraduate Pilot Training (UPT) construct. Similar replacement also occurred in the U.S. Navy with the TV-1 (also renamed T-33 in 1962) as more advanced aircraft such as the T-2 Buckeye came on line. 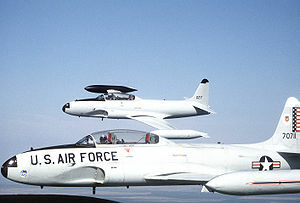 USAF and USN versions of the T-33 soldiered on into the 1970s and 1980s with USAF and USN as utility aircraft and proficiency trainers, with some of the former USN aircraft being expended as full scale aerial targets for air-to-air missile tests from naval aircraft and surface-to-air missile tests from naval vessels. Several T-33s were assigned to USAF F-101 Voodoo, F-102 Delta Dagger and F-106 Delta Dart units, to include similarly equipped Air National Guard units, of the Aerospace Defense Command as proficiency trainers and practice "bogey" aircraft. Others later went to Tactical Air Command and TAC-gained Air National Guard F-106 and F-4 Phantom II units in a similar role until they were finally retired. 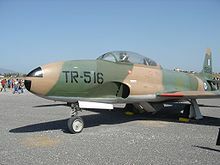 Some T-33s retained two machine guns for gunnery training, and in some countries, the T-33 was even employed as a combat aircraft: the Cuban Air Force used them during the Bay of Pigs Invasion, scoring several kills. The RT-33A version, reconnaissance aircraft produced primarily for use by foreign countries, had a camera installed in the nose and additional equipment in the rear cockpit. T-33s continued to fly as currency trainers, drone towing, combat and tactical simulation training, "hack" aircraft, electronic countermeasures and warfare training and test platforms right into the 1980s. The T-33 has served with over 30 nations, and continues to operate as a trainer in smaller air forces. Canadair built 656 T-33s on licence for service in the RCAF - Canadian Forces as the CT-133 Silver Star while Kawasaki manufactured 210 in Japan. Other operators included Brazil, Turkey and Thailand which used the T-33 extensively. 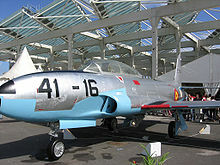 In the 1980s, an attempt was made to modify and modernize the T-33 as the Boeing Skyfox, but a lack of orders led to the cancellation of the project. 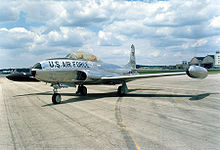 About 70% of the T-33s airframe was retained in the Skyfox, but it was powered by two Garrett AiResearch TFE731-3A turbofan engines. 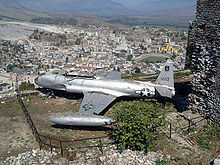 Picture - United States Air Force Lockheed T-33 reconnaissance plane forced down in December 1957, on display in Gjirokastx�r, Albania. In the late 1990s, 18 T-33 Mk-III and T-33 SF-SC from the Bolivian Air Force went to Canada to be modernized at Kelowna Flightcraft. New avionics were installed, and detailed inspection and renewal of the fuselage and wings were performed. Most of the aircraft returned in early 2001 and remain operational. A limited number of T-33s have found their way into private hands; some current owners: Michael Dorn of Star Trek: The Next Generation fame, Canadair T-33. and northern California based Greg Colyer of the T33 Heritage Foundation who operates a Canadair CT-33 Silver Star monikered "Ace Maker". On 6 September 2006, Imperial War Museum Duxford's Canadair T-33 (G-TBRD), owned by the Golden Apple Trust, was destroyed in a takeoff accident; the crew survived. G-TBRD was the first jet warbird to be operated from Duxford, arriving in 1975; it was originally registered as G-OAHB. In 2008, several T-33s in storage at CFB Mountain View, an old World War II era RCAF base south of Trenton, Ontario, were sold to various private collectors. 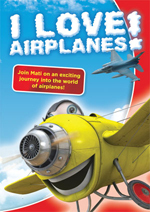 Six airplanes were purchased by a newly formed museum out of London, Ontario, called the Jet Aircraft Museum (JAM), associated with the Canadian Harvard Aircraft Association, which purchased the aircraft on behalf of JAM. The six airplanes, formerly designated #133346, now C-FUPM; #133500, now C-FUPO; and #133573, now C-FUPP, as well as #133052, #133263 and #133441, will be flown in airshows and for memorials across Canada and in parts of the USA. Other T-33s have also been sold to various US and Canadian buyers. T-33A: Two-seat jet trainer aircraft. AT-33A: Two-seat attack version of the T-33A. DT-33A: This designation was given to a number of T-33As converted into drone directors. 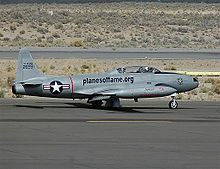 NT-33A: This designation was given to a number of T-33As converted into special test aircraft. QT-33A: This designation was given to number of T-33As converted into target drones. RT-33A: Two-seat reconnaissance version of the AT-33A. TO-2: Two-seat land-based jet training aircraft for the US Navy. It was the US Navy's version of the T-33A. Later redesignated TV-2. TV-2KD: This designation was given to number of TV-2s converted into drone directors. T-33B redesignation of Navy's TV-2 in 1962. DT-33B redesignation of Navy's TV-2KD. CT-133 Silver Star : Two-seat jet trainer for the RCAF/ Canadian Forces (also communications, target towing and electronic warfare duties). Paraguayan Air Force operated six AT-33A donated by Taiwan in 1990. The belonged to the Grupo Aerotx�ctico (GAT) 2nd. Fighter Squadron called "Indios". They were withdrawn from use in 1998. Unknown T-33, on static display in the Brazilian Museu Aeroespacial - Musal in Rio de Janeiro. Former Royal Canadian Air Force (RCAF) #133346,#133500,#133573 respectively registered as C-FUPM,C-FUPO,C-FUPP restored to flying condition with the Jet Aircraft Museum, London, Ontario. Former Royal Canadian Air Force (RCAF) #133052,#133263,#133441 under restoration to flying condition with the Jet Aircraft Museum, London, Ontario. Former Royal Canadian Air Force (RCAF) on a plinth, Pictou, Nova Scotia. First RCAF T-33 21001 purchased by Lynn Garrison in 1964 for display. Now on a plinth in Edmonton, Alberta. Unknown T-33, on static display in the Deutsches Museum Flugwerft Schleix�heim near Munich. It carries the markings of the German Luftwaffe. JASDF Air Development and Test Command (航空開発実験集団) T-33A "61-5221" is on display at the Kakamigahara Aerospace Science Museum(ja), Kakamigahara, Gifu. JASDF 8th Air Wing (ja) T-33A "71-5293" is on display at the Amagi Railway Amagi Line Tachiarai Station(ja), Chikuzen, Fukuoka. T-33A on display at the Royal Saudi Air Force Museum, Riyadh. T-33A-1-LO, 58-8189 is in the Yugoslav Aeronautical Museum in Belgrade. T-33A-1-LO, 52-9958 Yugoslav 10024 (serial number: 580-8189) is on display at Yugoslav Aeronautical Museum, Nikola Tesla Airport, Belgrade. T-33A on display at the War Memorial of Korea, Seoul. T-33, 57-0532, on display at Chung Cheng Aviation Museum. Unknown T-33A, on display at Royal Thai Air Force Museum, Don Muang AFB. T-33A-1-LO, 51-4419 and 17473: On loan from the USAF Museum at the Midland Air Museum, Coventry. T-33A, 55-4439, On display at the North East Aircraft Museum, Sunderland. T-33A-1-LO, 53-5974, is on display at the National Museum of the United States Air Force at Wright-Patterson Air Force Base, OH. T-33A-1-LO, 51-4301 is on static display at Vance Air Force Base, Oklahoma. T-33A-1-LO, 58-0629 is on display at Castle Air Museum at the former Castle Air Force Base in Atwater, California. The town of Othello, Washington in the United States has a decommissioned T-33 on display in a park near the City Hall. T-33A-1-LO, 58-0616 is on display at McChord Air Museum, McChord Air Force Base, Washington. T-33A-1-LO, 51-2129? 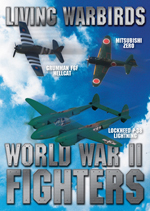 is in display at the Collings Foundation in Stow, Massachusetts. T-33A-5-LO, 53-5226N is on display at the National Air and Space Museum's Steven F. Udvar-Hazy Center. T-33A, 58-0542 is mounted outside the JROTC Gen C Powell Hall (Central High School JROTC, TX-936) on Highway 67 in San Angelo, Texas. Formerly N10265 at Texas State Technical College in Waco. T-33, 53-421, Modified as a play structure at Oak Meadow Park Los Gatos, California. T-33 located at Southeast Iowa Regional Airport in Burlington, Iowa. Unknown T-33, is under restoration to flying condition with the Collings Foundation out of their Houston, Texas facility. Unknown T-33, on static display, city park Hart, Michigan. Unknown T-33, on static display at the Franklin Institute, Philadelphia, Pennsylvania; painted as USAF tail number 0-36038. T-33 on static display at Harrison County Airport, Cadiz, Ohio, USA, tail USAF #29785. T-33 USAF tail #36053 on static display at Tiger Stadium, Louisiana State University Campus, Baton Rouge. Unknown T-33 on static display at a VFW post in Wilmington, North Carolina. Unknown T-33 in storage at Carolinas Aviation Museum, Charlotte-Douglas International Airport, Charlotte, North Carolina. 2nd Unknown T-33 in storage at Carolinas Aviation Museum, Charlotte-Douglas International Airport, Charlotte, North Carolina. T-33A 35979 is on display at the Prairie Aviation Museum in Bloomington, Illinois. T-33 on display at the Palm Springs Air Museum, Palm Springs, California. T-33A USAF Tail #19263 on static display at City Hall of Brooklyn, Ohio, USA. T-33A USAF Tail #0416988 on static display in Williams Park in Gibsonburg, Ohio. T-33A USAF on static display at Hector Municipal Airport in Hector, Minnesota. Baugher, Joe. "Lockheed P-80/F-80." Lockheed P-80/F-80. Retrieved: 21 December 2006. Lockheed T-33 Shooting Star Pictures and Lockheed T-33 Shooting Star for Sale.